Description: The Mayflower Park Hotel had pinhole leaks in its copper pipes. The restoration of the piping system in this 171 room historic hotel was completed in two stages over a 90- day period. During this time the hotel remained in operation. After three years, not a single new pinhole leak returned to the property. 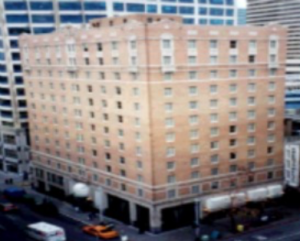 The Mayflower Park Hotel had pinhole leaks in its copper pipes. Repair by conventional methods to known leaks was first completed. A traditional repipe would have involved long downtime, loss of revenue asbestos removal, complete renovation of bathroom fixtures and a tremendous amount of guest inconvenience. The ACE DuraFlo system eradicated the pinhole problem. The restoration of the piping system in this 171 room historic hotel was completed in two stages over a 90- day period. During this time the hotel remained in operation. After three years, not a single new pinhole leak returned to the property. Prior to ACE DuraFlo® pinhole leaks had been an ongoing reoccurring problem. The hotel engineer noted that they had increased water flow and improved water conservation and no more leaks after the restoration. To the General Manager Mr. Paul Ishii, ACE DuraFlo® pipe restoration meant, as he said: â€œNo mess, short timelines, no walls cut, less cost and no guest inconvenienceâ€¦â€œWhat else could one ask for?